I'm trying an experiment this year with a classroom blog. Each year I set three goals for myself and each of the past four years communication with my students' families has been one of those goals. I'll admit that I'm not very good at sticking with it through the year. I'm hoping with the "push-button publishing" of Blogger it will be easier to keep up with it. It's day three here and as my fourth graders work on writing our classroom guidelines they have been doing some brainstorming. What would the "worst classroom" look like, sound like, etc. and what would the "best classroom" contain? Several of my students felt a best classroom would have students working quietly on worksheets all day while the teacher sat at his/her desk and did paperwork or played solitaire on the computer. No, they weren't joking. I'm working hard at changing their idea of what learning looks like to them. We began generating this web together, and then as they filled in their own details, I filled in mine. It was one of my attempts to change some of their thinking. 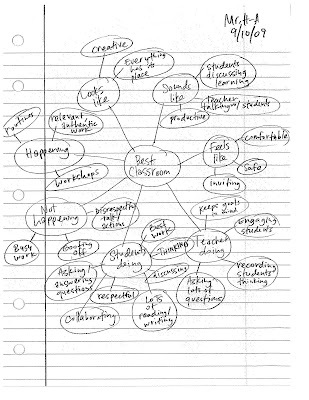 What would a "best classroom" look like and sound like to you?